(Newser) – The death toll in the suicide attack on a luxury hotel in Pakistan rose to 11 with at least 70 injured, reports the Times of London. At least two foreigners were among the dead at the five-star Pearl Oriental in Peshawar, though no more specific IDs were available. Still no claim of responsibility, but authorities suspect it's a Taliban strike in retaliation for the military offensive in Swat Valley. The truck carrying the explosives apparently got close to the hotel because it appeared to be delivering supplies.The attackers sprayed guards with bullets, then rammed the truck into the building and detonated it. The ensuing fire has reportedly gutted the hotel, which is a popular draw for foreigners. 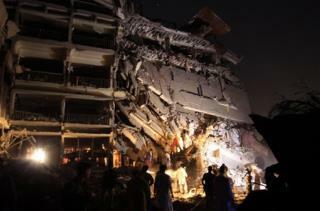 The attack is similar to one on the Marriott in Islamabad last September. The Taliban recently promised attacks in major Pakistani cities. So I wonder if Obama's speech is going to get credit for this too?